In fall 2011, Kelli joined the tennis team at Lyons Township High School and, not surprisingly, made an impact as much on the team as on the court. Kelli loved playing tennis, but even more, she loved making new friends. She also made an impression on her competitors, including those who played on rivals like Hinsdale Central, York, and Lincoln Way East high schools. In fact, after her passing, those schools sent counselors to LT to help Kelli’s classmates cope with their grief. For the past several years, LT’s tennis team has played in a special Freshmen tournament with those three high schools as a way to honor Kelli’s memory and establish camaraderie among the teams. 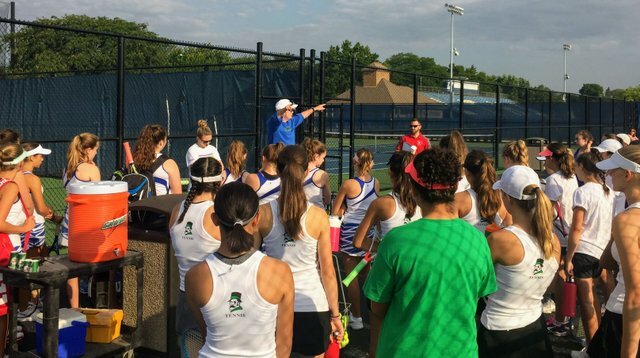 This year’s tournament, held in late August, marked the retirement of Kelli’s coach and tournament founder Ron Leban (in blue shown above) and the welcoming of the new JV tennis coach at LT, Jenna Reisch, who has been part of the LT and west suburban tennis family for several years. LT’s team beat Hinsdale Central and York this year, losing its doubles game to Lincoln Way East. “I was proud to see everyone try their hardest and further learn the game of tennis,” Jenna declared. The 2017 LTHS tennis team’s spirit of JOY extends off the court in other ways, as they plan to volunteer during the annual Run for Kelli on Sunday, Oct. 1.